The 57th Grammy Awards has finally arrived. It is no secret that the Grammys is the pinnacle of award shows for music (it’s only second in TV ratings behind the Academy Awards). Trying to put a jump on last year’s line-up and TV ratings, the National Academy of Recording Arts and Sciences Prior is hoping to piggyback on previous success. Prior to tonight’s televised portion, the Grammys kicked off their big night with the pre-Grammy show, where most of the awards are usually handed out. A flurry of winners were announced, including Aphex Twin, St. Vincent, Jack White, “Weird Al” Yankovic and Rosanne Cash. Judging from early press, Beyoncé Knowles may be on the verge of a killer sweep this year. The R&B-pop superstar is nominated for six Grammys tonight and is tied with the most nominations for this year with super producer Pharrell Williams and UK crooner Sam Smith. During the early portion, Bey won a few of those awards. She’s up for the biggest title — Album of the Year, but faces some very stiff competition. 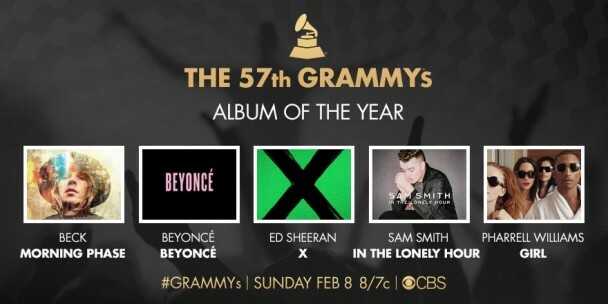 In that category are albums by Beck (Morning Phase), Ed Sheeran (X), Williams (Girl) and Smith (In the Lonely Hour). The UK singer, best known for his smoldering hit “Stay With Me,” mentioned earlier that if he does win the top title over Beyonce’s self-titled album (which HiFi gave a very dismal album review), he plans to give the award to Bey. We will see if that comes true. To date, Knowles takes the cake for having the most nominations in Grammy history (52 nods). She’s won seventeen of them (excluding the early wins tonight). The Song of the Year category also features Smith, which includes “Stay With Me.” Other nominees in that field include Sia (“Chandelier”), Meghan Trainor (“All About the Bass”), Taylor Swift (“Shake It Off”) and Hozier (“Take Me to Church”). OUR PREDICTION: “Stay With Me” has an advantage, but Taylor Swift’s cool and buttery pop tune “Shake It Off” could be a surprise winner. Don’t expect Swift to show up for an acceptance speech. She won’t be there, citing she needs rest for a very vigorous touring schedule in the days and months to come. OUR PREDICTION: “Stay With Me” will probably win. Other predictions aren’t always easy. You have to know the conscious of the voting body of NARSAS and keep in mind that this is not a simple popularity contest. Almost always are these albums awarded because they feature Top 10 hits or because this is simply music’s biggest prom night. It’s usually about merit and timing. 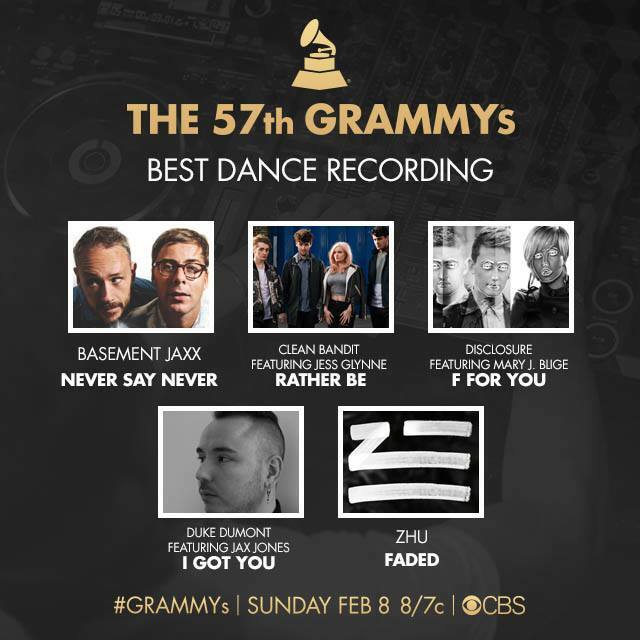 For Best Dance Recording, Clean Bandit’s delicious “Rather Be” seems like a very sure win. We selected it as the best song of 2014. But considering that “Never Say Never” is also on our list of best songs of 2014 and that “F for You” was a stellar standout on Disclosure’s last album, any of those guys are contenders for the big win. For Best Rock Song, Hayley Williams and her Paramore gang looks like a crowd favorite for the unexpected breakthrough hit “Ain’t It Fun.” In our review, we pointed out that it was the best song off the album and was deserving to be a single. The labels and the powers that be listened, and the world was pleased. But Jack White‘s “Lazaretto” and the Black Keys‘ “Fever” are also decent nominees. We’re still pulling on Paramore to win this fight, even if it’s pretty much a pop-rock song. The New Artist of the Year category could be the most controversial title this year as Aussie rapper Iggy Azalea faces off with Smith along with pop group Haim, British rock band Bastille and country singer Brandy Clark. Azalea has been suffering on social media from a stunning backlash of social media debate that surrounds the subjects of race, cultural appropriation and black erasure. After NYC rapper Azeaila Banks set off a firestorm of tweets about Azalea, even leading other black performers to jump into the conversation voluntary or involuntarily, it has somewhat put her in a dangerous position as a new artist. And yes, it’s worse than when Macklemore & Ryan Lewis won Best Rap Album over Kendrick Lamar. OUR PREDICTION: We won’t say. We don’t want to start a fire we can’t afford to put out. Azalea is a much different place than her contemporaries. She’s the only female rapper to produce a solo No. 1 hit on the Billboard Hot 100. And she’s far from being a one-hit wonder: Her debut LP, The New Classic, has yielded two other Hot 100 hits and is also nominated for Best Rap Album tonight. All eyes will be watching this event, even if it’s just for tomorrow’s headline drama on the rap blogs. Pop princess Ariana Grande is also scheduled to perform, Lady Gaga and Tony Bennett will sing some pop jazz and AC/DC will bring some rock firepower to the tube. John Legend and rapper Common will perform “Glory” from the ‘Selma’ motion picture soundtrack. Beyoncé is scheduled to perform “Precious Lord, Take My Hand,” a song originally sung by Ledisi in the film. Lots of controversy amongst R&B lovers erupted on social media when word leaked about the performance snub and has not withered. Everyone is still talking about Bob Dylan‘s mammoth speech during his MusiCares Person of the Year. After being introduced by former U.S president Jimmy Carter, Dylan took the stage and delivered a speech that turned out to be over 30 minutes long. There was lots of historical footnotes, thanks to legendary pioneers (John Hammond, the Staple Singers) and words of wisdom. Check out the speech in text by clicking here. To see a full list of tonight’s winners and category nominees, click here. The 57th annual Grammy Awards air Sunday at 8 p.m. on CBS.